Keila Banks is only 15 years old, but she has a good message on work-life balance, and she’s running with it. Banks is a coder from Los Angeles, and she has been giving talks since she was 11. She has spoken at an Open Source event before 4,000 people, and she has spoken at a computer science event at the White House. She’s a self-taught programmer and web designer. Her father takes her around to various events around the world. Pogharian said she heard from dialysis patients right across Canada, congratulating her and wishing her success. She was 17 when she invented a cheap, portable dialysis machine. Aashna Mago, 19 years old and from Newtown, Pennsylvania, came out to join us and perched on a table. She moved into Castro House in April, after leaving Stanford to work for Rothenberg Ventures, a VC firm with a focus on virtual reality. At the firm, she works with portfolio companies, writes code, and stitches together video to create virtual-reality scenes. 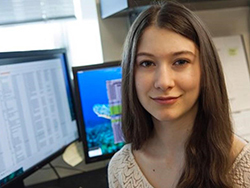 Paulina Raguimov never expected to get paid to make video games when she walked into her high school’s career fair at 16. She played them, sure. But when she walked up to the JumpStart booth to chat about the internships they had available, she had absolutely no experience with making games. “I didn’t even have a resume, I had only just become eligible to get a job at all,” she told me last week. The fact that women are missing from STEM (science, technology, engineering, and math) fields is not a secret. But as a teenage scientist deeply involved in science and engineering while still in high school, I see the problem as a straightforward one: I believe that in their earliest years, girls lose their spark—they succumb to societal hurdles and mental obstacles that have existed for as long as they can remember. Laura's come a long way from her prior misconceptions about Computer Science being "an old man in a dark environment coding zeroes and ones." Laura has been featured in The Daily Beast, The New York Post, had the opportunity to participate in a variety of coding workshops at Spotify and Microsoft, attended the Paley Center For Media's "Cracking The Code: Media's portrayal of Women in STEM, was invited to a private screening of the movie,"The Imitation Game," attended Glamour's Woman of the Year awards ceremony, and (in her spare time?) volunteered at Mount Sinai in the pathology department. In school, I was like most girls. A promising student who, over time, found myself focusing more and more on reading and writing and less and less on math and science. Maybe that's because I was naturally more interested in those fields—or maybe it's because my math and science teachers never expected me to do as well as their male students, never pushed me as hard, never encouraged me forward. Philipino-Canadian Ann Makosinski caught media’s attention after winning the 2013 Google Science Fair in the 15-16 age group category. She was named one of Time magazine’s 30 Under 30 Youth Changing the World, and was featured on “The Tonight Show with Jimmy Fallon,” NBC News, PBS, Yahoo News and more. Makosinski has become an inspiration to youth around the world, showing that one can invent the future—with inspiration, curiosity and a desire to work towards a goal. After surviving a bout with a rare liver cancer at age 12, Elana Simon, now 18, teamed up with one of the surgeons who treated her, set up shop in a medical lab, and began to collect much-needed data about the rare illness she'd endured. She gathered tissue samples from patients coping with the same cancer, fibrolamellar, performed genomic sequencing tests, and found a common genetic mutation across all of the samples she collected. Elana's results were published in the top journal Science, and formed a basis for a new website, the Fibrolamellar Registry, which she built to help empower fibrolamellar patients to share their own medical data for use by researchers working to find a cure.